Showing all news posted in November 2014. 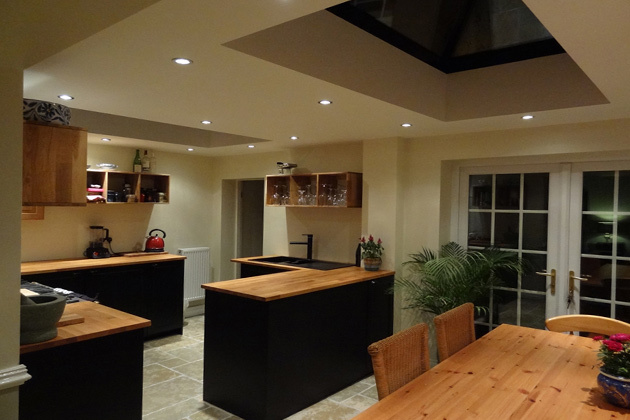 AMA recently undertook a small kitchen and dining extension in a semi-rural setting for a private client. The original cottage was small in its footprint and also fairly constrained to the front and rear, with neighbouring properties and a rear lane/wall. The answer was to insert a delicate single storey extension in the yard, which was the full width of the building between the boundary walls. This also allowed for opening up the existing ground floor space to connect with the new extension. The extension is an extremely pleasant, double roofed, light filled kitchen and dining space, with a modern touch to a traditional cottage. The end result has provided the client with the perfect space for relaxing and entertaining.